Divine Weeks' farewell record is for anyone who has ever raised a fist or lighter (or even a god-forbid cell-phone) at a rock and roll show, lost in the passion of the moment. For a brief period in the early 1990s, Divine Weeks were one of the most promising bands in L.A. with a fan base that grew with every explosive live performance and a debut record produced with assistance from the Dream Syndicate's Steve Wynn. Bill See's soaring vocal range and Raj Makwana's guitar pyrotechnics elicited comparisons to Bono and the Edge. Wearing their sincerities proudly on their sleeves, the U2 references were justified and well-earned. Unfortunately, the timing just wasn't on the band's side. Their first attempt at a broader U.S. tour ended with band-splintering tensions (masterfully captured in See's band memoir 33 Days) and their second album, a strong statement amidst a shuffled line-up, was released on the same day as Nirvana's Nevermind, which swept their kind of grand musical vision from the pop music landscape. Seemingly overnight, sincerity was passé and reaching for an audience was a sell-out. But life has a way of rewarding persistence. 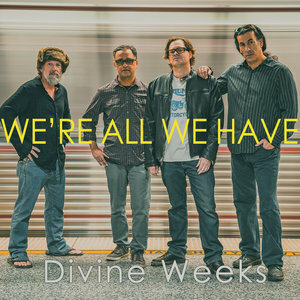 Divine Weeks, 30 years removed from their obituary and only two years after a fine reunion album, return with We're All We Have, and it's an album that should make listeners mourn what could have been twice over: that this band didn't get its chance to develop over time at its first inception, and that its second coming is, with this their proclaimed farewell release, at an end. The album opens with a one-two-three punch of strong songs. The third of those, "Don't Get Caught on the Wrong Side of History" argues for the love of country, not as it is but as it can be at its best. It's the kind of song and message to embrace in paranoid and fractious times. "Love will light the darkness tonight" is See's refrain throughout, as he confronts the forces that "divide us and demonize us, distract and prey upon our fears". At the center of it all is compassion for each other, as he sings in "We're All in One & One in All: "Don't you know only love can bridge this deep divide?" That's the sentiment that opens the album, in the soaring, uplifting "Fight For Love". Here Makwana's guitars ring at their most Edge-like, and See's vocal reaches for the stadium's back row: "You look down on me with a face of hate / Will you fight for us? And fight for love?" Darkness and doubts seep in as the album progresses, but they are always overcome by a spirit of communion, trust in our better selves, and a commitment to healing. "Too Much Beauty" confronts suicide, not from a mournful but understanding perspective for a soul that feels too intensely. Ultimately, it's a song of healing for those that have been left behind. "Darkness Brings Out the Light in Me" follows, with See confronting his father's abandonment and turning that pain into the strength of persistence. These are songs that confront the brokenness of the world while celebrating how we can and do put ourselves back together. Album closer "Hold on to Love in a World Gone Mad" is an anthemic counterpoint to despair. Divine Weeks have put together an album the hard way, all on their own, and they've done it right in every detail. We're All We Have is packaged in an attractive case with a lyric booklet and ample band photos. Holding this package, listening to the contents, it could be 1992 again (there's even a song called "Love Is a Mixtape"), and that's a damn fine thing because the album is also an homage to the rock and roll spirit. It's loud; it's passionate, and it's heart-on-the-sleeve sincere. This is an album for anyone who has ever raised a fist or lighter (or even a god-forbid cell-phone) at a rock and roll show, lost in the passion of the moment.